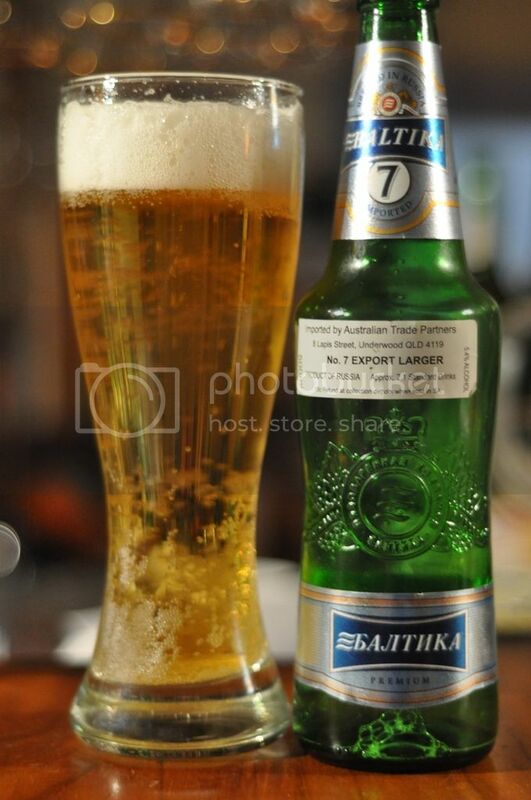 Baltika is the leading beer producer in Russia and produce a large number of beers. This particular one in the #7, the Export Lager or Dortmunder. The brewery in St. Petersburg was founded in 1990 just before the fall of the Soviet Union in 1991. This is the first time I've sampled the #7 but I have had the pleasure of sampling many of the other beers produced by Baltika. I must say the raised glass logo on the bottle looks brilliant! A Dortmunder is basically a pale golden lager which should taste similar to a German Pilsner. It's just what I'm looking forward to right now! It looks like a German Pilsner so that's a positive start. The beer pours a clear golden colour with a three finger white head. The head doesn't last long however and disipates very quickly but it does lace the glass quite nicely. Baltika seems well carbonated by the large number of bubbles rising to the head. It's a nice looking beer, should be good. Baltika #7 smells alot like Baltika #3 and for that matter Baltika #5. The beers all smell of slightly sweet grains with a hint of citrus. I can also smell some quite bitter floral hops, which seems to balance the nose. This beer doesn't have any of the nastiness that many other beers of this style can have on the nose, there is no element of skunking present; just a nice clean smelling lager. This is by far the least sweet of the 3 Baltika pale lagers. The grain base is very slightly sour, before some, surprisingly, bitter floral hops bite into the palate. These hops also have a spicy note to them that was not evident in the smell, but definitely are a welcome addition to the beer. So far so good but the finish is rather disappointingly watery and slightly sweet. It really let down what was otherwise a really good beer. For mine this is a serviceable lager without being a standout. The spicy hops have a good level of bite for the style and give the beer a bit of character. It's quite drinkable but the relatively high carbonation might make it difficult to drink as a session beer. Overall though it's a nice lager with good drinkability and certainly worth a go. It's also easy to get, so no excuses! Love this stuff,personally i think its light years ahead of certain other more mainstream chemical slop.I could drink it all night but at 5.4% it might get a bit messy.